That's the question you'll want to ask your friends and family from here on out. 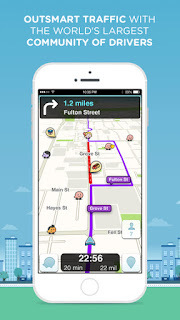 Waze is a smartphone app that is a community traffic and navigation app. The Waze community allows you to join drivers who share real-time traffic information. Now owned by Google, this community-based app gives you the best route to your destination based upon updates from your fellow drivers and data acquired by Google from local and state traffic systems. It even updates the best route while you are driving. Waze is a powerful app because of this constant updating of information. Millions of drivers are updating road conditions such as construction zones, accidents, potholes and even police traps. This real-time data means that it is much more than regular maps you can find on your iPhone or Android phones like MapQuest, Apple Map or even Google's Map app. 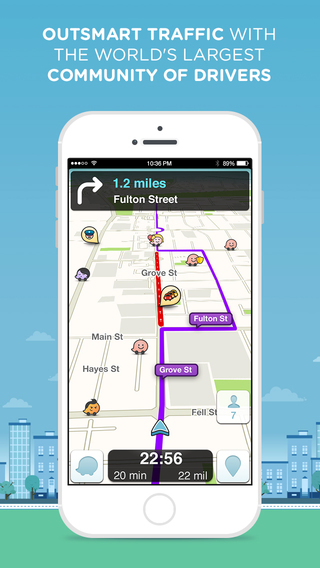 As you drive to your destination, Waze will pop up information and audibly alert you to upcoming conditions. You'll know about that police car on the other side of the hill before you even see it. It's easy to find and connect to fellow Wazers from your social networks. You can connect your Waze account to Facebook, Twitter and Foursquare. Once connected, you can share ETAs and destinations. This is a great option if you are travelling to the same destination in separate vehicles. I've found having a good phone mount on the dash works best to avoid distraction and I always use the voice reporting to tell Waze about road conditions that I encounter. This makes it easy to share information while keeping my eyes on the road. 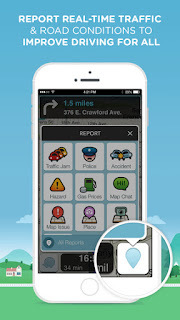 You can download the free Waze app for iPhone from iTunes HERE and the Android from the Google Play store HERE.